Thank God, I finally visited Bali as I planned before. My plane departed for Bali on 2nd July 2009 around 10 AM. Kinda woke up late, so I took taxi to Changi Airport, despite my initial plan to take MRT. Despite the pandemic of H1N1, the AirAsia servicing Singapore – Bali route was surprisingly packed. The check-in queue was very long. I saw a number of Indian guys wearing the same T-Shirt, bringing huge many luggage. Among their luggage, I saw what I assume the containers of traditional Indian musical instrument. Apparently these guys are members of a music band. I assume either there’s Indian wedding that going to be held in Bali, or they are actually participating in Bali Art Festival. My family had arrived in Denpasar early in the morning, so they will pick me up at I Gusti Ngurah Rai International Airport. I waited for them not more than 5 minutes. Then I saw my father and my youngest brother sitting in the front seat. I waved at them, then they stopped the car. After group-hugging session, we went for lunch. We did not try the local cuisine, we settled with East Javanese food instead. Either-way, I was really hungry, so any food will be fine with me. Moral of the story, contemplating with choice of food means you’re not hungry enough. After lunch, we went to Benoa beach. Over there, me and my younger brothers did parasailing. My youngest brother was the one very persistent asking us to go for parasailing. He sort of challenging his elder brothers, saying that he was only 5 years old when he did parasailing for the first time. And he claimed that he did not afraid at all. He is still 9 years old now. From Benoa beach, we took a boat trip to visit the Turtle Island. They run a turtle conservation there. The conservation camp also have other animals like snake, birds, eagle and rabbits. We are allowed to pose together with the animals and take pictures. In the way out, there is a donation box for the tourist to slip in money to help the conservation camp funding. On the second day, we left the hotel quite early. We went to Sukowati Market. This market is really the place if you are looking for souvenir on bargain. It is so cheap, I am not allowed to disclose you the prices there :D. We bought a number of T-Shirts. My brother bought a number of handcrafts. I also saw a foreigner bought a bulk number of paintings. I spoke to him asking what was the price. Then he whispered to me the answer, another proof that we must keep the prices information secret! After that we went to Padang Galak beach, we are supposed to watch the Bali Kite Competition. Unfortunately, we arrived too early. And it was almost noon of Friday, we must find a mosque to perform Friday prayer. After Friday prayer, we went to Seminyak Beach. I have been dreaming to do Bungy Jumping, but so far I can only make joke about it. So I did make the jump. It was really GREAT!!!! I’ll visit your place again, AJ Hackett. At night, we visited Taman Werdi Budaya (the Denpasar’s Art Center). They have a “wayang orang” show. It is a play combined with dance that use fragments of epic Ramayana or Mahabharata story. The dialogs were in Bahasa Indonesia, with occasional short sentence in Balinese, Javanese and English :D. The story was about the period when Rama and his monkey army lead by Anoman are going to attack Alengka. Although the story is about Ramayana, I think the main characters of that night show was the Punokawan. Anyway, discussing about the existence of the Punokawan in Ramayana and Mahabharata epic will need another blog post. In short, the dance was great, the dialogs was interesting and mostly funny. I also noted that the show was also used to convey moral messages to the audiences. Roughly the messages were we should stay away from drugs and alcohol, drive safely on the roads. The third day was going to be short, because at midday my brother must fly back to Jakarta. His company requires him to work on Sunday. Not every Sunday, but just this Sunday. So we left the hotel earlier than the previous day. We went to Bedugul. Bedugul was totally different experience compared to Denpasar. The air was fresh, the temperature was low, no fog, with plenty of sunlight and awesome clear sky. We had our breakfast there. Nothing beats breakfast in a restaurant, above the lakeside, with a fresh-cool temperature, having fried rice, pancake and a glass of warm tea. After breakfast, we went fishing. We caught a few fishes. In the end, we did not consume the fish, we release them back in the lake instead. If I think about it again, it is kinda cruel right? I tempted them to bite the hook, which is really painful, but I let them live their misery for the rest of their life. PETA must be really hate me now. After rushing to send my brother to the airport, we went to Garuda Wisnu Kencana monument. It is an unfinished monument actually, but the view is still spectacular. I heard hearsay about making the monument higher than the Statue of Liberty 🙂 For now, the monument is still waiting for someone with very deep pocket to fund them to finish the monument. In conclusion, my short trip to Bali was totally worth it. I wish I have more time to stay there. 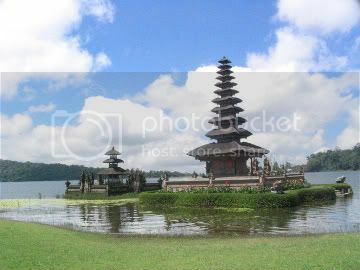 There are so many places in Bali that I did not have the chance to visit. So definitely there will be a next time.